Practice Flag Cloth ONLY. (Flag Twirling Batons NOT included and sold separately). Durable and attractive Flag Twirling Case. White 100% cotton gloves. Includes ONE pair. 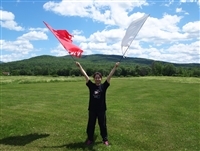 Swivel tube is for Flag Twirling batons sold by Shachah. Soft Handle Ball for Twirling Flag Baton. Waving Flag Fiberglass Rod ONLY. Consuming Fire Waving Flag CLOTH ONLY.